211 Bernard: Here Be Monsters Anthology #5 launch tomorrow! 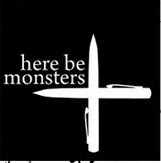 Here Be Monsters Anthology #5 launch tomorrow! Come by the store tomorrow night, Thursday, April 14th, for the launch of Here Be Monsters Anthology #5! "Some of you may be wondering what Here Be Monsters is. It is an anthology of short stories by Vincent Mackay, Alex Newcombe, and Duane Burry. The stories themselves were created because the three of us wanted to write for fun. We met every week or so and wrote story ideas, bits of dialogue, and characters on scraps of paper. Each of us would reach into the pile, pick one up, and write a part of a story using what we were given. We eventually decided that completed stories would be more fun than snippets done in a single evening and that was the impetus for Here Be Monsters."